“In vino veritas,” so they say. A very simple truth is the fact that grape harvesting comes before wine drinking. But how? By hand or by machine? The romantic image of the grape harvest that is often used in movies and that has surely inspired one or the other Hollywood star to buy their own vineyard will surely be a bit spoilt if we consider a wine consumption of 20 litres per capita in Germany alone. These figures mean a lot of work in very little time for about 80,000 winemakers in Germany who cultivate and harvest wine on about 102,000 ha. This is why many winemakers opt for state-of-the-art grape harvesters instead of manual labour. Grape harvesters are very versatile and can successfully harvest up to five hectares in three hours. To achieve the same result with manual labour, about 40 to 60 workers are needed. 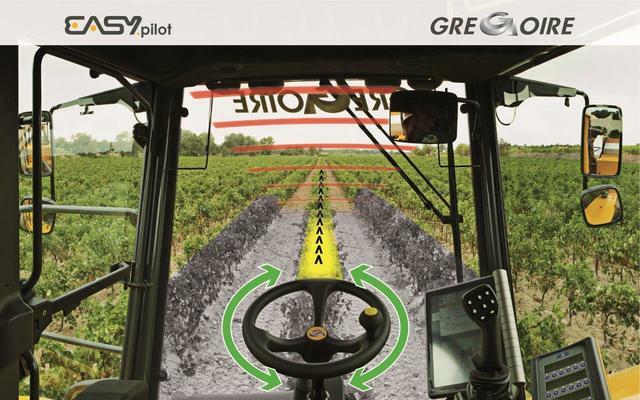 With EasyPilot, the manufacturer of multi-equipment carriers and harvesters, Grégoire, has created a sensor-assisted automatic line guidance system that boasts a precision of 3 cm without needing a GPS position signal. The French company Grégoire is a manufacturer of grape harvesters. These vehicles can optionally be equipped with EasyPilot – a system for automatic line guidance. It boasts a precision of 3cm without depending on satellite signals. The grape row is detected by ifm’s O3M 3D sensor system. It analyses the scene in front of the harvester “point by point” using ifm’s patented PMD technology (time of flight). Since the environment in front of the machine is digitised in this way, the general properties of the vines can be detected and visualised in an abstract fashion. Inaccuracies caused by vine branches from the side or high grass are reduced to a minimum. Just lay back and wait for the next grape row: EasyPilot is an automatic line guidance system based on the O3M sensor system from ifm. It almost turns the driver into a mere spectator. While the grape harvester moves over the vines, it creates a tunnel beneath the driver’s cab. This tunnel is provided with glass fibre rods that create vibrations. This is how the grape row is shaken, so that the grapes fall on the conveyor. The conveyor transports them to a collector. A fan removes unwanted elements such as leaves and tiny branches. Another sensor is positioned on top of the grape harvester’s driver cab. This sensor looks down to the ground and determines the height and thickness of the cordon. A guiding track that is generated after the signal is processed visualises the grape row as a model. This model is used as a basis to calculate the ideal route for the harvester to take. 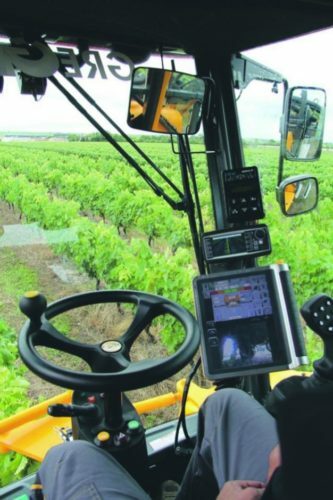 When the machine is in the grape row, the driver starts EasyPilot via the screen inside the driver cab. Once the system is started, all the driver needs to do is have an eye on the operating speed and the tools – everything else is taken care of by the system. When the end of the grape row is reached, a visual and acoustic signal will inform the driver that the harvester needs to be turned around to move along the next grape row. Marie-Claire Fink works at the Corporate Communications department, ifm electronic in Essen. 3D sensors from ifm for mobile applications. 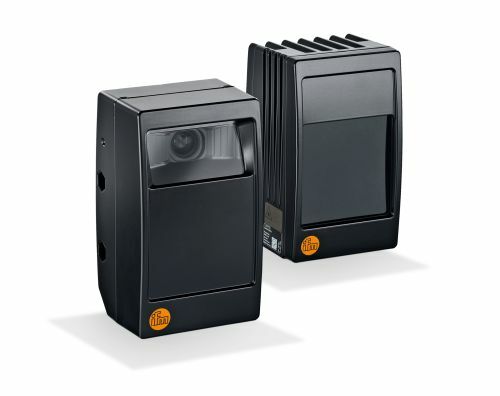 The O3M 3D sensor for mobile applications captures the surroundings of mobile machines three-dimensionally. ifm is a manufacturer of sensors, communication and control systems. After many years of intensive cooperation with our customers, ifm has become established on the market as a service-oriented sensor specialist, and today we are represented in more than 70 countries worldwide with more than 6,700 employees. Would you like to know more about the O3M?